In light of reform to the National Curriculum and the critical need for skilled teachers to implement policy in modern languages, the Arsenal Double Club is very well placed to make a significant contribution to extending language learning in primary and secondary schools. The interdisciplinary approach combining language learning and football skills offers teachers and learners a fresh perspective on language pedagogy. The inaugural session at Holy Trinity Primary School in Hackney was very successful and highlighted a number of key principles and pointers for the future development and wider dissemination of the CPD programme for the year ahead. 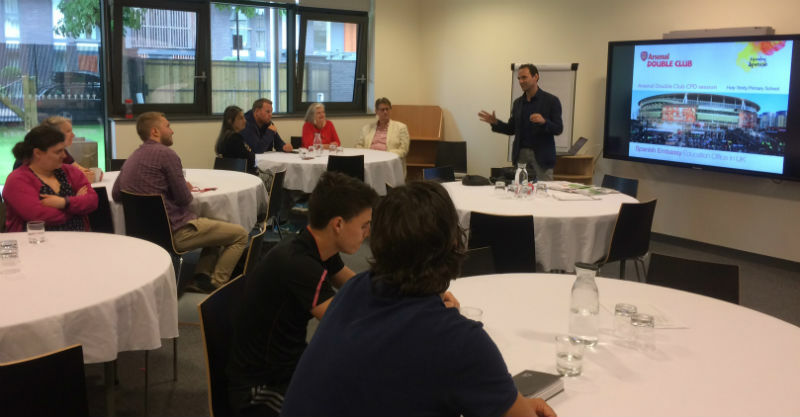 The pedagogic session focused on Spanish and was conducted by Jesús M. Hernández González, Education Advisor at the Spanish Embassy’s Education Office, and the practical session was led by Steve Eadon, Project Coordinator for the Arsenal Double Club. The length of the session was two hours and involved approximately 20 teachers from local primary schools, including language teachers, general teachers and PE teachers. The length of time is sufficient to make this programme worthwhile and feasible to deliver to primary teachers attending the CPD session directly after school hours. The availability of a first class artificial pitch at Holy Trinity made the delivery of the practical training possible and teachers found this highly motivational, as they could put in practice the pedagogic principles that had been presented in the theoretical introduction. The division between the presentation and the practical session works very effectively overall. he presentation in Part One focused on information about the programme and provided a very professional and coherent overview of the materials and additional resources available in the programme. The practical session in Part Two involved teachers playing with the ball. They were actively applying and consolidating language skills, practising football skills, getting into teams and playing a competitive game with refereeing in Spanish. The practical session convinced the teachers that the approach was valid and relevant to them and to their learners. They may not have been fully aware of how the materials and approach dovetail with the requirements of the National Curriculum. We believe we have established an appropriate mix between giving information and demonstrating delivery methods in the classroom and during practical sessions, all of which is intended to not only inform and give ideas to teachers, but crucially to stimulate creativity.